Stress is a universal feeling. Whether you have a project due in the coming hours or your assignments are piling up, stress sends a burst of cortisol and adrenaline throughout your body. Not only do your glucose levels rise, but your heart beats faster and your blood pressure increases. Everyone experiences stress with different intensity and frequency. The most common reaction to stress is called a fight-or-flight response. This allows us to either conquer the tasks ahead of us or run away from our responsibilities. Contrary to the belief that stress is unhealthy, a certain dose of stress is actually good for you and can be quite helpful too. With a modest dose of stress, our bodies can react to the tasks at hand positively, allowing us to tackle our responsibilities with greater efficiency. Stress can even help our memory! The hormones released during periods of stress such as cortisol, epinephrine, and norepinephrine primarily help you survive. Researchers have recently found that stress hormones can strengthen your immune system and protect against Alzheimer’s. 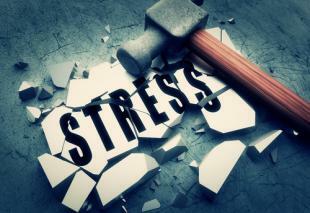 While stress can be helpful in small doses, it’s important to avoid chronic stress. Imagine yourself working late hours at the office. You’ve got a big presentation to give the next day and only a few hours to complete it. Your work just keeps piling up, and soon you feel a heavy pounding in your chest. Many people would take this natural fight-or-flight response as a sign to run away from the work. Stress has often been categorized as unhealthy. However, it’s best to use it to your advantage. Instead of shying away from your responsibilities, use your sharpened senses to fuel your work, giving you the ability to work with greater efficiency. High levels of stress and feeling stressed for a period greater than 24 hours can cause terrible damage. Cells can cease to regenerate normally when one’s heart muscles are constantly subject to adrenaline. Changes will also occur in the arteries. When experiencing chronic stress, its more difficult to relieve the symptoms. These symptoms include common colds and mental blurriness. Daily exercise, especially after a long work day, can help relieve stress and simultaneously prepare your body for the next bout with a stress attack. Eating cleaner and avoiding foods with lots of sugar and fats can always help you feel better and perform better in stressful work situations. Stress truly does affect each and every one of us in a different way, making stress a subjective experience. Its critical to be responsible for your own stress management. Understanding and using stress management tools will increase your grit, efficiency, and drive. Many people will attempt to eliminate stress in life without considering its positive effects, but life would lack excitement without a little bit of stress. Remember: instead of fleeing from the stress, embrace it and use it to your advantage to help you conquer your daily battles!